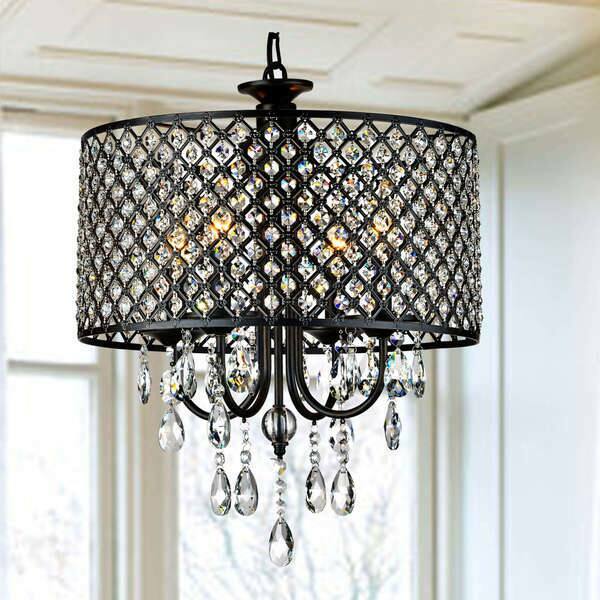 Add stately elegance to your home with the Berger Antique Black Four-light Round Crystal Chandelier. 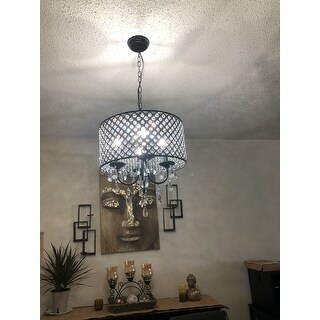 This chandelier features a unique contemporary style with a antique black finish and crystal accents that you will love. I am so happy with my purchase!!! I looked for a chandelier for our dining room for two years, and have never seen anything like this! I wanted something that would satisfy my husband's modern style while giving me something a little glamorous and unexpected. I fell in love with this chandelier because the modern pendant shape is what you see in all the design books and modern furniture stores...but the crystals gave this a fabulous twist. After reading all the rave reviews, I had to see it for myself - so glad I did!!! Yes, it takes a little time to put on the crystals - but like everyone says, it's just a night or two in front of the TV. Very easy and so worth it!!! My husband installed it himself, it is very easy. Please note the chain has a caribiner clip that allows you to adjust the height before you hang it. My daughters and husband say it's the best thing I ever bought! Another note - it looks amazing with frosted bulbs! Clear bulbs are a little too much for me, more like a disco ball. 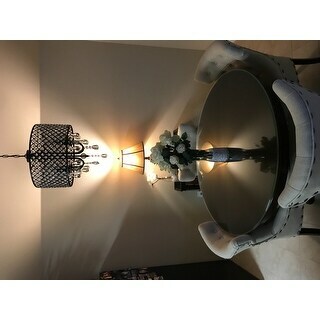 I bought this with another chandelier that I am returning and I just wanted to say how thrilled I am with Overstock's customer service - they are so kind and make it so easy. You never see that anymore. This is one of the most beautiful chandeliers I have ever seen, I stop and admire it every time I walk by the dining room. our house is craftsman style, with lots of straight angles, simple bold lines, and oil rubbed bronze....this chandelier works beautifully with the simple drum shape and oil rubbed bronze finish, but the sparkle and the crystals just add a really playful element that softens up all the heavy, straight elements of the house. It's a great chandelier if you're looking to combine the masculine (the heavy, simple drum shape), the feminine (the swarovski-like crystals), and a some whimsy (the drop crystals). Ours is hanging near dining room windows that get lots of sun, so the effect is fabulous all day. And we live on a corner and when I was walking the dog yesterday afternoon I noticed that when I looked into the window during the daytime the chandelier was sparking like crazy from the inside...and the sun wasn't even on it. Did not expect that. If you get this chandelier get clear candelabra bulbs, bc then with all the hundreds of little reflections on the crystals you won't even be able to see where the bulbs are, pretty great. Oh, and this is a chandelier that definitely calls for a DIMMER, you get a remarkable range of mood with these crystals and a dimmer....so grab a $7 dimmer from your hardware store and install that at the same time to get the full wow effect. I love this chandelier. I installed it as more of a flush mount because I don't have very high ceilings in my bedrooms, so I shortened the chain to about 5 inches. It was a little difficult to install, but now that it is up, I love it! I love the sparkle and the shadow that it casts on my walls. This is worth the money. I have been looking at similar chandeliers for three times the amount. People are right when they say it is very dark bronze, but the "old world rustic bronze" is almost black. It only took me about 20 minutes to put on all the crystals, so I'm not sure what is taking other people so long. I bought a similar one for my other bedroom and is coming in the mail today...I can't wait to put it up! Wonderful fixture! This is for you who want a little flashy without over doing it. This is elegant and will grab attention. The pendants are easier to install then I thought they would be. I highly recommend this antique bronze round crystal chandelier! I am so happy we went with this light! Now I understand all of the wonderful reviews! We recently did a full renovation on a townhouse we just bought. We have dark hardwood and light beige walls. This light is PERFECT for the space. Our ceilings are only 8' 0", we originally we were a little concerned with the size of the light. My fiance just cut the chain shorter and pulled the cable through to make the chain only about 6 inches long. We used clear light bulbs, which YES they display a very noticeable pattern all over the walls. WHICH WE LOVE! It adds such a character to our home. I would suggest putting in a dimmer with this light, we have yet to do so...but I think it would be a perfect light to dim! I shopped around and this is by far the nicest quality at the cost. I purchased two chandeliers from Overstock not knowing how they would look in person and was pleasantly surprised that I had two great options. This one was the winner simply because it has all the sparkle on the drum shade. The crystals are plastic but heavy and a pretty nice quality. 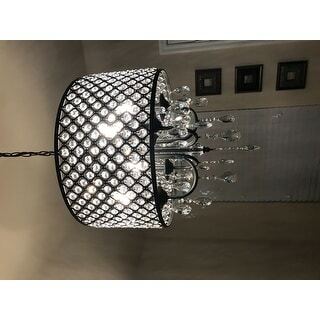 Also, the crystals that you hang from the bottom were exactly the same on this one and the other chandelier I purchased (quantity and quality) so that should not be a factor if you are trying to decide between two versions on Overstock (I also purchased the Indoor 4-light Chrome Antique Bronze Chandelier). The crystals cast a rainbow when the light hits it just right. There is a cast on the walls from the unique shade but I think it is beautiful. Highly recommend this chandelier! You will not be disappointed. Highly recommend this beautiful fixture. The metal work is heavy and sturdy. The color is actually matte black; not antique bronze. The crystals are beautiful and filled with reflective colors. The design and crystals look spectacular from outside and add to the curb appeal as well. This fixture and lighting transformed the dining room with modern contemporary design. Product was delivered quickly in great packing and good condition. Easy to hang and lots of extra chain to swag. The small crystals in the drum were pre-hung and the drum was shrink wrapped to ensure crystals were safe in transport. 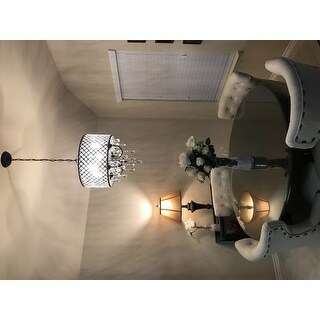 I strongly recommend this chandelier; it's fabulous!! What you see is what you get but even better. Ordered this chandelier for our dining room.It arrived in tact promptly- within four days of ordering. It was breeze to install with very clear directions. Attaching the crystals took me about 10 minutes. I'm not sure why other people had a harder time with this. The color is a black/bronze which looks very nice with my reclaimed barn-wood floors. The size and weight are on point with the measurements on the sight. I was worried about it being large enough but it's is suitable for above the dining table. The dining room is part of a large open area in the front of the house so I was concerned about the scale. The light nicely separate the dining area from the seating area. I wish they had a slightly larger size but it works. My electrician removed 3-4 pieces of chain in order to make it a more ideal hight. We have 12ft ceiling, if it helps. A dimmer is a must for this lamp. The lamp glitters and glows with 4 revel chandelier bulbs on a dimmer. The way this lamp throws light has me sold. My style is a little rustic/industrial so this is a nice touch to pull it all together in a glamorous manner. Photos avail on insta gram- user mochibunny. A seriously good value. This item shipped quickly. It took a few hours to hang all the crystals on the Chandelier. It is beautiful on or off. The antique bronze is more black with streaks of brown. The dome was completely black. I just figured that the crystals stands out better shining off that black. It stands out in my dining room. It gives off plenty of light. Very nice! I would recommend it to anyone, although, a lot of my crystals were missing but that is being corrected. Absolutely stunning. If your looking for bling, this is it. Love it!!! Perfect for a romantic setting in bedroom and/or dining room. Please note, the shade is covered in glittery crystals which does cast shadow of round bubbles on the walls that surround the room. At night when the night is on, the room looks as if your under water surrounded by bubbles......really neat, calming and relaxing feel. Adds some texture to your painted walls. 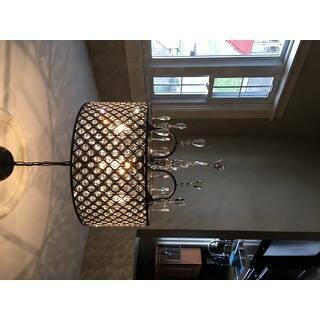 This is why I would recommend this fixture for a bedroom or dining room, rather than a hallway or foyer. This looks just as wonderful in-person as on-line. My husband and I are thrilled with the results. We assembled it over a few movie nights, as it took a few hours to put together. Installation was easy. The large crystal in the middle was chipped, but thanks to them sending spare parts, we were easily able to fix it. The sparkle and shine are amazing - we certainly recommend it! The fixture of this lamp is Antique Bronze (80 percent black, 20 percent dark brown) so it does look quite black. To help future customers understand the color better, we have added the color explanation to the product description, and added two images showing the color details. I saw this chandelier in an upscale home my husband and I were touring to purchase. Our jaws dropped when we saw two of them hanging on top of the kitchen island. I told my husband I wanted the house!! Unfortunately we were outbid and I had to part from them. To my wonderful surprise I found them here and they are so affordable!! I ordered two and will install them into our next new home! I just got them in the mail and so happy to finally have my hands on them. As most recent reviewers mentioned they too came with all the small crystals attached and shipping was very quick. I love them so much I could hug them, haha! HIGHLY RECOMMENDED!! I literally squealed with delight when I pulled my chandelier out of the shipping box. It was much prettier in person than in the photo. The light catches all of the little crystals and throws little rainbows in the daytime. Each little crystal in the shade is held in place by beautiful little silver filigree pieces that add yet another dimension of texture and beauty to this light. I debated for months on a chandelier for my new house and looked at literally hundreds of chandeliers on the internet. I finally chose this one because there simply was nothing else out there as pretty and unique as this chandelier. I am absolutely thrilled with it and smile every time I walk by it. If you want something unique and gorgeous- this is it!! The only issue was that I have 17 foot ceilings and so I had to buy extra chain, ground wire and electrical wire. (came with 39") Then an electrician had to rewire the base before he could hang it. This cost approx $200. I wish these chandeliers had different lenghts but the base price was reasonable and so it all worked out fine! We like this fixture and it's looks good. The one issue is that the "crystals" are actually plastic, so that is a disappointment and I don't recall that being noted. Just had the light installed by an electrician. BEAUTIFUL! I had it placed where a recess light was above the bar. Used a ceiling medallion to cover the large hole from the recess can instead of having sheet rock repair. Looks perfect. No one would ever know and cheaper. The light was packaged well. No damage, came with spare parts/crystals. The crystals to the shade were already attached. Just had to attach the hanging crystals (25) in all. took 30 minutes. I attached them after installed. Just looks beautiful, especially with the light against the crystals. would highly recommend!! A beautiful addition to my house..
Beautiful lighting that has a nice detailed Crystal and the metal antique hardware is perfect for my office room. I love the light when the crystals hit it at night and aluminates my feeling very nicely. This chandelier is beautiful but some of the crystals were missing and had to wait 4 weeks to receive them. And unsure but light bulb continues to blow and waiting on electrician to come look at. Chandelier is over our stairway so is quite high. Electrician not looking forward to checking this out. Love them, perfect size for the space. Picture on site is accurate Glad we made the purchase. Stunning!!! This light is absolutely gorgeous! Glass beads, great quality. You will not be disappointed! Looks great, even better in person. Easy to hang too. Play around with bulbs until you find the perfect effect. It’s worth it. "What is the light bulb base size? " The bulb base is E12. "What is the measurements on the ceiling mount?" The dimensions are 5.1 inches in diameter X 1.1 inches H.
"Will this be too big for an entryway that is about 4'x10'?" Yes, it will be too big for an entryway that is about 4 feet x 10 feet. Definitely not. Coincidentally, I have this same fixture in a entry way/mudroom coming in from the garage that is 4' 7' x 10' with a 9'ft ceiling and it looks great. You'll just need to hang it high enough that one can clear it walking through. "This fixture is advertised as being a black finish but in the specs it says it's an antique bronze finish. Which one is it?" The finish is Antique Black(black finish with a light brush of brown), not antique bronze. Thanks for bringing this to our attention, we will update it. "Is it difficult to put on the crystals??" It's not difficult to put on the crystals. The crystals have been attached to the drum shade. You just need to hang the bottom crystals from the light fixture. I haven't tried yet, however, I would probably recommend putting them on after you have hung the light as they will probably get in the way. "What if I need extra chain?" "Can this chandelier be used in a different country besides the US? " Yes, this chandelier can be used in a different country besides the US. The bulbs and voltage need to be 110V, it can be used in Canada too.